Fractured society, fractal protests: a street clash in Caracas. Flickr / Andres E Azpurua. Creative Commons / No derivatives. “Before, we wanted to change the world. Now we’re going to see if we can pave a few roads.” This epithet of José Mujica, avuncular president of Uruguay and former urban guerrilla, sums up the hard-earned wisdom of the Latin American left in power—in Chile, Brazil, Argentina and elsewhere. For the last 15 years, however, Venezuela’s government has read the message in reverse: forget the roads; change the world. Wilfully eccentric and, on occasion, deeply flawed economic, social and foreign policies—none more so than vis-à-vis food and basic security—have resulted in a monumental challenge to the government of Nicolás Maduro, elected successor as president to Hugo Chávez. The protests, driven by students and whipped up by opposition leaders, have been classified by viral-media reflex as another instalment of popular revolt, centred on a basic middle-class wish for decent, effective, open government. A close reading of the violence that has claimed 37 lives since February 12th would suggest something different. A mass national polarisation has assumed fractal form—small, side-street sub-plots of irreducible antagonism, with contrasting accounts of who pulled the trigger. According to the opposition, 20 have been killed for demonstrating. But attributing responsibility is phenomenally hard in a society where no security or judicial institution is independent and most victims seem to have died in a chaos of reckless urban crossfire. It would be easy and temptingly cathartic to see the events as world punditry would have you see it: university kids against a tongue-tied tyrant, youth versus age, liberty versus oppression. But recent history cannot be blotted out. The 37 dead are not the classic fallen martyrs; nor are the protests a wave of the disenfranchised. Rather, they mark the most recent manifestation of the long and intransigent resistance to the low-income electoral juggernaut of chavismo. What began as a failed coup in April 2002 morphed eight months later into a general strike against the government; a recall referendum was essayed and lost in 2004; mass electoral abstention followed a year later. A new and seemingly effective means of campaign has been chosen, in which both moderates and radicals in the opposition can find a purpose. Mass urban protests and civil disruption are the methods. To beat the left in power, the resistance to chavismo has borrowed from the now-pragmatic guerrillas: take the “counter-“ out of revolution and man the communal barricades. It is difficult to begrudge the opposition their discontent. Statistics on poverty and public welfare confirm the gains made under Chávez through his social reorientation of oil revenues. But idiosyncratic and populist economic policies have done much to paralyse the most basic market flows. Anecdotes abound of four-hour queues in state-provisioned supermarkets and missing toilet-rolls. In January, scarcity stood officially at 28%, meaning over one in four goods was unavailable. According to the Venezuelan Pharmaceutical Association, 40% of medicines are out of stock. Nor is economic failure the inevitable fate of a left-leaning Latin American government. Comparisons between the trajectories of Bolivia and Venezuela show the popular benefits of the chavista regime but also the waste of its oil fortunes. Unlike Bolivia, Venezuela has spent its windfall and whittled down its foreign reserves. Argentina, under its profoundly Keynesian economy minister, Axel Kiciloff, has in the past two months skirted dire, Davos-like predictions of devaluation and ruin by giving free reign to a technocratic Central Bank governor. No such checks apply in Venezuela. The economic malaise—the shortages, closures, 56% inflation, the latest devaluation this week—is much more than a minority, middle-class concern. Likewise, fear of crime touches all in Venezuela. Amid polarised government and independent estimates, the most distinguished expert on crime, Roberto Briceño-León, reported more than 24,000 killings last year—next to Honduras in presenting the world’s highest homicide risk. The authoritarian drift of the government, whether in deploying armed militia, packing the Supreme Court or taking TV channels off air, garners the greatest international opprobrium and the most irate domestic opposition. And it has treated chavista hate figures—General Raúl Baduel, Iván Simonovis and even, on a lesser scale, a Financial Times freelance—with exceptional viciousness. Excuses are available, yet futile: a bombastic government represents the majority of its people with neither gentleness nor grace. But successive election victories and consistent polling data underline that chavismo will not be defeated on the agenda of constitutional virtue. Economics and crime are what motivate mass popular discontent. Yet the past one and a half months tell a story not of a shared public platform, and an eventual if reluctant state response, but of a social dissolution into teeming individual claims, each in search of a protector. An extraordinary film made by pro-government media in Mérida, the Andean town that has become a protest heartland, tells the story of two communities living along a main road. One, reportedly the richer, has set up a barricade, where hooded, darkened shapes lurk, catcalling and menacing the poorer neighbours, who find it hard to get to work or even go shopping. The poor shout insults back at the rich, calling them mantenidos (spongers). The first woman to appear in the film, Gisela Rubilar Figueroa, has since been shot dead. This is not mass protest so much as atomised class war, an iteration of grudges and rivalries emanating from the brain stem of an oil state. How genuine discontent with a new government turned into a zero-sum conflict shattering to the micro-scale is the core question. Some protesters, notably the students of the Central University of Venezuela led by Juan Requesens, maintain a genuine mobilisation in the public interest—some have even led proselytising missions in the shanty towns, a peculiar reversal of the Peronist Youth’s doomed popular-education programmes of 1970s Argentina. Requesens and colleagues want political prisoners freed—there are 85 in jail for their part in the protests, according to the NGO Foro Penal—and the militias disarmed, plus a live, televised meeting between President Maduro and the opposition. Last year’s losing presidential candidate, Henrique Capriles, holds similar convictions; so do many of the more enlightened opposition figures. Public opinion broadly aligns with these demands. The usually reliable polling agency Hinterlaces has recently found people worried over their economic futures, although 87% have no faith in barricades or violence to extract them from chavista mismanagement. Belief that Maduro should be kicked from office, in the manner of a number of Latin American presidents at the turn of the millennium, has receded quite quickly—with fear of what might take his place looming large. This hefty bloc for moderation should in principle act as a brake on recourse to violent protest. It is still possible that this majority middle ground, whose shift to Capriles almost handed the opposition an astonishing victory last April, will be assisted by mediation by Latin American states in the UNASUR bloc (whose foreign ministers conducted a successful visit to Caracas last week), and possibly the Catholic Church (which proved vital in the resolution of Argentina’s crisis in 2002). The sudden eruption of peace should never be discounted, as Venezuela and Colombia memorably showed in resolving their border tensions of 2008. The obstacles, however, will be immense. Talk of clearly definable sides, of the sort which backed Maduro or Capriles last year and which each enjoy huge numerical legitimacy, is no longer so pertinent. The opposition is manifestly divided and its main propulsive energy comes from the leaders who have adopted the salida (exit) strategy—the plan to topple the president through street agitation. Leopoldo López is in jail; María Corina Machado has just been stripped of her parliamentary immunity. Seeking to lock both away appears to have redounded to the president’s benefit but this leaves the radical protest wing in place--just criminalised, localised and leaderless. Maduro is a weak president, with a 1.5% margin of victory last year and little political capital to expend. There is much speculation in diplomatic circles, and evidently in the US military, over how far the loyalty of the Venezuelan armed forces and the ruling PSUV party will stretch if the violence worsens. Should Maduro be scrutinising his support network for rogues and turncoats, it is unlikely he will feel sufficiently assured to hand any major concessions on policy or political participation to the opposition. It would suit him in the short term instead to engage in direct, winnable battles with the most radical diehards. Arguments can be twisted into unusual shapes by the tangles of received wisdom. The government engages in the usual US-baiting rhetoric, laced with attacks on local fascists and some turgid chunks of Gramsci. The hard left consumes ideas such as those of the German Marxist Heinz Dieterich, who chides the government for its “fear of using state forces firmly and rapidly from the start to dismantle violent groups”. The opposition’s extremes are no better, refusing to recognise any merits in 15 years of chavista government and finding their convictions richly fulfilled by the riot police who greet protesters in Caracas or Táchira. One implacable statement of hostility, the Mérida Manifesto by a group of students, refers to how “the Castro-communist regime with its paramilitary groups and the National Guard have killed, tortured and harassed comrades”. The informal paramilitarism we are seeing on both sides is the product of a society besieged by criminal violence for two decades. The Guatemalan ethnographer Tani Adams argues that long-term exposure to chronic violence causes each citizen to assimilate a quota of fear into normal life, as “many people face both the challenge of multiple traumatic experiences in the past as well as the likelihood of continued traumatic experiences in the future”. One result is the severing of social bonds beyond immediate family and friends, as well as the corrosion of empathy “when people are constantly spurred by survivalist motives”. The pathologies of the Venezuelan psyche under the influence of criminal violence help explain the fanatical tensions that have surfaced between neighbouring communities. And no doubt pro-government militias and community self-defence groups recruit locals used to handling firearms for other purposes. 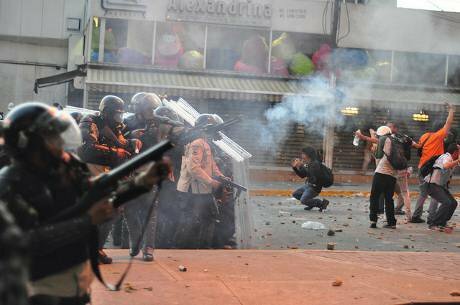 Through this admixture of political and criminal violence, the road to civil war in Venezuela lies. Avoiding that outcome is not made any easier by the tendency inside and outside Venezuela to see the crisis through the filters of self-interest and prejudice borrowed from the era of high Chávez. The left-leaning governments of Latin America are intent on preventing any precedent of presidential overthrow—hence the paralysis of the Organization of American States. Cuba and the Caribbean dread a stoppage of cheap oil. Washington would be happy to rid itself of an irritant, while the liberal press and the digital spirits egg on the cause of middle-class revolution. Arguments can be twisted into unusual shapes by the tangles of received wisdom. Noam Chomsky denounces any use of repressive state power while his followers applaud a crackdown in Caracas. Opponents of Maduro wail over the militarisation of their cities, even though for many this would be their preferred solution to violent crime. And according to reliable sources the Green Party MEP and hero of May 1968, Daniel Cohn-Bendit, has dissented from his own party’s pro-chavista instincts, insisting he would never fail to support a student revolt. Partial truths and worsening polarisation will do little to pull the country out of its confrontational logic. Nothing is more important than for foreign governments and organisations to provide moderates on both sides with support and reassurance. Just as Capriles has preached against violent protest, parts of Maduro’s government have proved themselves sensitive to criticism: the attorney general, Luisa Ortega, has said 60 investigations of police officers for alleged human-rights violations are under way. A common ground of dialogue could be found, were Latin American states, the European Union and neutral bodies to support it, on economic stabilisation and security reform. Talk of sanctions against government figures would have to be shelved and political prisoners released, with all parties accepting the schedule of forthcoming elections. The self-righteous on any side would not be satisfied. But no one seems to have a clue as to the road ahead for Venezuela were its president to totter.